Armani is a beautiful child with a sweet disposition. She has many physical challenges that will require medical care throughout her life. 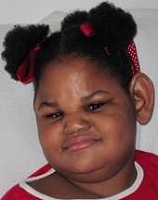 Armani is a friendly child who thrives on positive interactions with her caretaker. She responds to touch, sounds and nurturing. She enjoys playing with her toys on the floor, thereby supporting activities needed to enhance her daily living skills. Armani needs a family who will commit to her life long care and surround her with love, stability and understanding she deserves. A family trained to care for medically fragile children will be beneficial in providing care and support for Armani.